Cape Cod Lodging at the Inn at Lewis Bay Bed and Breakfast, West Yartmouth. 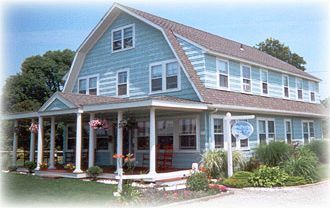 The Inn at Lewis Bay is a 1920s Dutch Colonial which is set in a quiet seaside neighborhood of Cape Cod. The inn boasts a large dining and living room with a fireplace which is the perfect place to make new friends or to enjoy afternoon tea. Or, if you prefer, select a popular novel from our reading nook and simply relax at the beach or in the backyard. All of the six bedrooms have private baths, air conditioning, queen sized beds and antique tubs. The rooms are all decorated differently and reflect special little touches of Cape Cod.